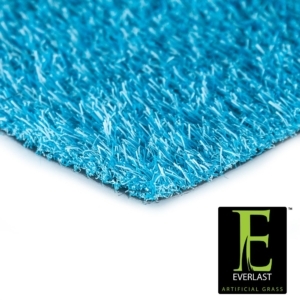 Liberate your creative self with Everlast Turf Color Turf! 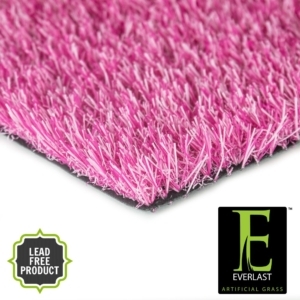 Available in color swatches ranging from a classy Slate Gray to a bubbly Pink Blend, Color Turf is a great way to make home applications stand out from the crowd! Each color turf product is a soft polyethylene turf that stands at .75 inches tall and has a face weight of 36 ounces. Color Turf products showcase dual blade color tones and also feature a thatch layer that is slightly lighter than the face yard for a special eye-popping experience. Color Turf makes a wonderful addition to any deck, patio, office or pet pad! The synthetic turf backing features a tuft bind technology as well as perforation, so clean up after entertainment, pets or children is simple, quick and easy! Backed by our 15 year warranty, Color Turf products are the perfect option to showcase space’s unique quality. Add a little accent to your decor with Color Turf synthetic grass products!